The aim of the game is to get your Yooyu from where he is to the sun exit, collecting sun tokens along the way, while avoiding spike balls and spike chains. Help train your little Yooyu through ten levels so he can be in top shape for Yooyuball tournaments! All you need to play is a mouse. 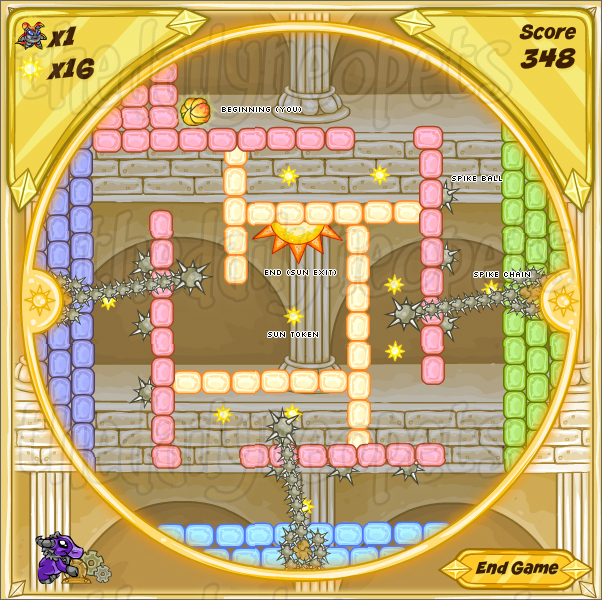 Holding the mouse down, you drag to rotate the maze to move your Yooyu along walls or onto platforms. (You can have your mouse anywhere on the screen). You'll need to think fast once the Yooyu starts spinning and racing down slopes, as if he hits a spike ball or spike chain, you lose a life. Pick up sun tokens- they are good! Have your Yooyu run them over to collect them. (See below for more info on these). Reach the sun exit to proceed to the next level. If you are unfamiliar with the game, I would recommend placing your mouse on an outside wall of the maze, or somewhere inside it to rotate the maze. If you have your mouse too far away, say, where the score is displayed in the top right corner, it will take you longer to move your mouse to another section of the screen to rotate the other way. This game requires you to be able to rotate faster than that, especially if a spike chain is coming at you! Also, being too close to the middle of the maze isn't the best idea to begin with, either. You can lose control quickly, as this will end up rotating the maze too fast. Once you are familiar with the game, you can try out different methods to find what suits you. To complete each level, you don't have to collect all the sun tokens. Collecting them does add to your score though, and for every ten you collect, you gain an extra life! So they are worth taking risks for. Lastly, take your time! While you do have to move quickly to dodge the spikes, there are often places you can safely stay put. Get to them, stay there. Figure out your next move. Think ahead- where can you safely stop next? When is it best to start moving to avoid the spike chain? Which platform are you aiming for? This game takes a lot of time and practice to master. However, the highest score you can get is 2,450, so there's no competition against other Neopians if you're going for gold. The only competition is yourself. If you can manage this score, you'll be admiring a shiny new golden trophy! Good luck and have fun!